NEW YORK -- There were no acrobatics, backup dancers or special effects when P!nk took the stage to perform "Wild Hearts Can't Be Broken" at the Grammy Awards. All it took for the 38-year-old songstress to bring down the house was a white T-shirt and jeans, a sign language interpreter, her voice and a powerfully timely song. Her performance of "Wild Hearts" spoke directly to the resilience of the Time's Up movement and the broader cultural reckoning with gender issues, sexual misconduct and inclusivity. "There's not enough rope to tie me down. There's not enough tape to shut this mouth," the chorus begins. "The stones you throw can make me bleed, but I won't stop until we're free. Wild hearts can't be broken." In stark contrast to her other celebrated Grammys performances (think "Glitter in the Air" in 2010), P!nk stayed firmly on the ground and at her microphone for the entire performance, using only her voice and her message to wow the audience into a standing ovation. She was accompanied by sign language interpreter Jenese Portee, also clad in matching jeans in a white T-shirt. 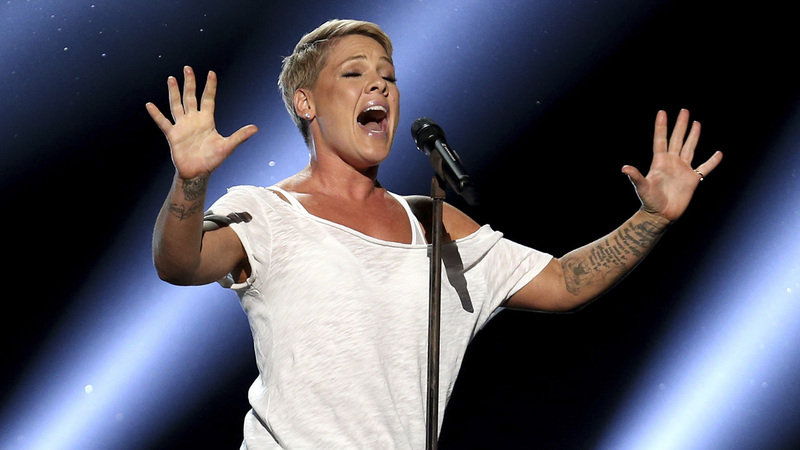 P!nk's performance was just a part of the larger conversation surrounding equality and opportunity during the show. In an homage to their film peers decked out in black at the Golden Globes, many artists wore white roses to the show in support of Time's Up. Critics also viewed this year's nominations as giving rap artists overdue recognition. Kendrick Lamar had picked up five awards by the end of the telecast's first hour and is still up for record of the year alongside colleagues Childish Gambino and Jay-Z. While accepting her award for best new artist, winner Alessia Cara discussed the importance of creating equal opportunities for all regardless of "popularity contests" and politics. "Thank you to my parents and my brother for believing in me," she said, urging the crowd to "support real music and real artists because everyone deserves the same shot."